Symptoms are more pronounced at the caylx end. Apples are smaller and misshapen. Cause These diseases are caused by Apple scar skin viroid. Many infected cultivars of apple or pear do not express symptoms of disease. It has become a problem when old orchards are top worked, and the new scion is susceptible to the viroid that had been symptomless in the original cultivar. 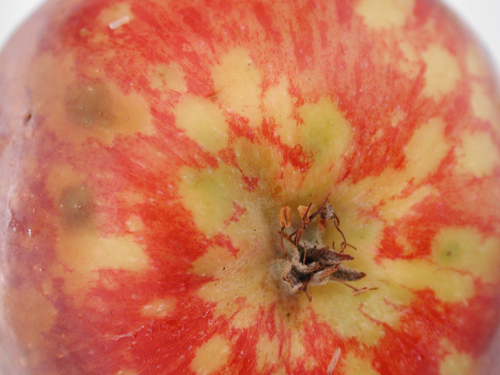 Pear also appears to be a symptomless carrier of Apple scar skin viroid. The pathogen occasionally spreads slowly in the orchard, but the mechanism(s) is not known as there is no known insect vector. It has been suggested that root grafts may account for this slow spread. It can be seedborne as well as transmitted with contaminated scissors. Symptoms Affected fruit bears small circular spots near the calyx end of the fruit. As the fruit matures, the spots enlarge and the spots increasingly contrast with the darkening background color of the fruit. Larger spots may coalesce to form a broad band of dappling. 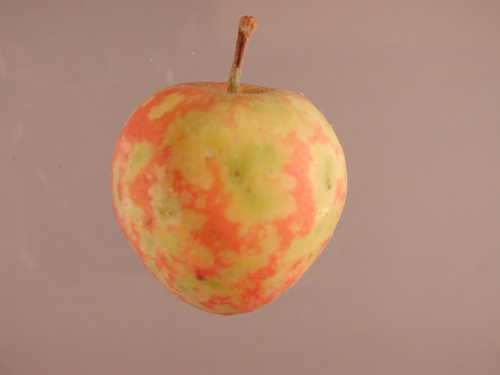 In the case of the more severe scar skin, the circular patches become brown and necrotic, and fissures appear on the fruit. The affected fruit is smaller than fruit of unaffected trees. Use virus-tested (and found to be free of all known viruses) certified material. Use a disinfestant on contaminated pruning or cutting equipment. Temperature therapy of infected stock and subsequent propagation of juvenile tissue has been successful.